Percutaneous transluminal angioplasty (PTA) of the renal artery has become an increasingly widespread peripheral vascular intervention for the treatment of renovascular hypertension (HTN). Catheter-based procedures began in 1964 when Charles Dotter initially developed PTA for treating peripheral vascular atherosclerosis. Andreas Gruntzig revolutionized the technique in 1974 when he developed a soft, flexible, double-lumen balloon catheter for use in coronary arteries. Renal arteriogram obtained after renal percutaneous transluminal angioplasty. In the United States, renovascular HTN is present in approximately 4% of the total population of persons with HTN. It is associated with increased morbidity because patients with severe HTN who have renovascular HTN are at increased risk for renal insufficiency. Traditional therapeutic modalities that include drug therapy and surgical revascularization have too many shortcomings. Medicines frequently fail to adequately control the patient's blood pressure (BP) adequately despite polypharmacy; medicines may cause undesirable adverse effects; and patients may be noncompliant. Moreover, lowering BP in the presence of severe renal stenosis may lead to ischemic renal atrophy. Surgery imparts considerable morbidity, and results vary. The associated need for general anesthesia may cause complications in patients, who are often poor candidates because of diffuse atherosclerosis or renal insufficiency. Nonetheless, the correction of renal stenosis is considered the treatment of choice whenever feasible. Alone or in combination with stent implantation, PTRA is increasingly used as an alternative to surgical revascularization for the treatment of RAS, which may cause HTN or jeopardize renal function. Technical success is usually achieved in more than 85% of cases; the failure rate is 10%. Renal artery stenosis in patient with medically refractory renovascular hypertension. Regarding asymptomatic RAS, as many as 50% of patients with RAS do not have HTN. The incidence of progression of RAS is variable, but progression occurs in most patients. The overall progression rate is 49%, with 14% of patients developing total occlusion. Serum creatinine values do not adequately mirror progressive anatomic disease, and control of HTN does not thwart progression of RAS. The absence of HTN after PTRA does not preclude restenosis. Atherosclerotic RAS (ARAS) is a common condition that is often but not necessarily associated with HTN. Because of its progressive nature, ARAS is becoming one of the leading causes of end-stage renal disease (ESRD). Indeed, ARAS is reported to progress within 5 years in 51% of patients, and renal atrophy develops in 21% of patients in whom ARAS is initially greater than 60% of the caliber of the vessel. These epidemiologic data emphasize the need for an aggressive diagnostic approach and treatment of ARAS, for the treatment of HTN, and for the prevention of ischemic nephropathy. These goals may be achieved, to some extent, with PTRA. *Ostial location is an independent predictor of poor outcome. Clinical success rates are 54% at 3 years, with high restenosis rates. When the cause of renal stenosis is FMD, the results of PTRA are uniformly good, with cure in about 58% of patients, improvement in 35%, and failure in 7%. These results are comparable to those obtained with surgery. Restenosis is uncommon in patients with this condition, and follow-up angiograms (< 5 years after angioplasty) often show no trace of stenosis. Short balloon-expandable stents are usually used for renal stenting. In patients in whom PTRA is technically successful, a prompt decrease in BP is usually observed. The mechanism of this early decrease is not understood. Plasma renin activity, norepinephrine, and muscle sympathetic nerve activity all increase in the first or second hour, despite the falling BP. This finding raises the possibility that some vasodilator substance is released. In the atheromatous patients with unilateral stenoses, the eventual benefit rate (defined as improvement or cure of HTN 3 months after angioplasty) was 87%; in the FMD patients, it was 92%. Patients with stenosis and a solitary kidney are excellent candidates; one series showed a benefit rate of 92% for such patients. Differences in the criteria used to select patients, in defining an improvement in BP, in the duration and modalities used for follow-up, and in medical treatment hamper any comparison of studies addressing the effects of PTRA on BP. Despite these limitations, authorities have generally agreed that for patients with ARAS, PTRA rarely leads to a reduction in BP. In a review of the experience in 10 centers, 691 patients were treated with PTRA. About 19% were cured; BP improved in 51%; and BP was unchanged in 30%. In other reviews, the effects on BP were even less encouraging. For instance, 8% of several hundreds of patients with HTN were cured with PTRA. In a study by the present authors, 66 patients were followed up for at least 6 months; the patency of the dilated artery was confirmed mostly by means of echographic Doppler velocimetry. In these patients, the rate of cure was 3%, with a 38% rate of improvement. The introduction of stents has not improved the outcome of PTRA with regard to BP. A 4-year follow-up study of 163 patients who were successfully treated with stent implantation showed that only one was cured; improvement was seen in 42%. These negative results are not surprising in consideration of the fact that the great majority of patients with ARAS have been exposed to the deleterious effects of high BP for years. Their HTN results in extensive renal and vascular damage, which prevents BP from returning to normal levels, even after the stenotic artery is dilated. This conclusion obviously stresses the need for the careful selection of the few patients who may benefit from dilation procedures. For patients who do not fulfill the diagnostic criteria for real renovascular HTN and those in whom even PTRA is considered too risky, medical treatment permits the same degree of BP control achievable with dilation. Indeed, three major studies that compared the effects of PTRA and medical treatment in patients with ARAS showed that the BP reductions obtained with the two approaches were similar (see Table 2 below). [21, 27, 28] The only advantage for patients treated with PTRA was diminution of their drug regimen. Theoretically, PTRA should be used more for preserving renal function than for reducing BP. Given the progressive nature of ARAS, PTRA should be performed before ischemic damage to a kidney has occurred. Renal outcome with PTRA is better when renal function is still normal than when it is altered. In general, the overall cardiovascular risk for patients undergoing PTRA with a baseline serum creatinine level greater than 1.5 mg/dL is 5 times higher than that of patients with a creatinine level below that value. In a large meta-analysis, 25-53% of patients who underwent PTRA had some improvement in renal function. In another review of 215 patients with ARAS and mild renal insufficiency treated with stent implantation, 35% had improvement in renal function, as estimated by assessment of changes in serum creatinine level or creatinine clearance. In 35% of these patients, the condition was stabilized with the procedure. Bax et al found that in patients with atherosclerotic renal artery stenosis, renal artery stenting had no clear effect on renal function impairment and led to significant complications in some patients. The multicenter trial included 140 patients with creatinine clearance less than 80 mL/min/1.73 m2 and renal artery stenosis of 50% or greater. All patients received medical treatment with antihypertensive agents, a statin, and aspirin. Although 64 patients were randomized to stent placement, only 46 had the procedure; in many patients, assessment of RAS by noninvasive imaging was inaccurate, and stenting was in fact not indicated. Progression of renal dysfunction, as indicated by a decrease in creatinine clearance of 20% or greater, occurred in 16% of patients in the stent placement group and in 22% of patients in the medication group. Serious complications in the stent group included two procedure-related deaths. Over the course of follow-up, 36 patients (60%) died, mostly as a consequence of cardiovasvular events (54%). At 1 year, 21 patients (37%) had angiographically documented restenosis. Hypertension control was stable over the follow-up period, with an ongoing need for antihypertensive medication. Renal function continued to be moderately reduced and did not differ between patients who had restenosis and those who did not. Unfortunately, there is no consensus regarding valid markers of a favorable renal outcome with PTRA. One may use the radioisotopic technique, which allows an accurate evaluation of the split function of the two kidneys. This method may avoid the limitations inherent to assessments based on creatinine and creatinine clearance. The preservation of renal function depends not only on the restoration of renal blood flow but also on the wearing off of other ischemia-induced mechanisms of renal damage that may fully regress only after a long period. PTRA may affect the glomerular filtration rate (GFR) of the dilated kidney, as well as baseline values of peripheral plasma renin activity and angiotensin II (Ang II). These changes may suggest that the degree of activation of the renin system could be a predictor of the functional recovery of the kidney. Bloch MJ, Pickering T. Renal vascular disease: medical management, angioplasty, and stenting. Semin Nephrol. 2000 Sep. 20(5):474-88. [Medline]. Geroulakos G, Missouris C, Mitchell A, Greenhalgh RM. Endovascular treatment of renal artery stenosis. J Endovasc Ther. 2001 Apr. 8(2):177-85. [Medline]. Kandarpa K, Becker GJ, Hunink MG, McNamara TO, Rundback JH, Trost DW, et al. Transcatheter interventions for the treatment of peripheral atherosclerotic lesions: part I. J Vasc Interv Radiol. 2001 Jun. 12 (6):683-95. [Medline]. Levy JM, Duszak RL Jr, Akins EW, Bakal CW, Denny DF Jr, Martin LG, et al. Percutaneous transluminal renal angioplasty. American College of Radiology. ACR Appropriateness Criteria. Radiology. 2000 Jun. 215 Suppl:1015-28. [Medline]. Oliva VL, Soulez G, Therasse E. Renal angioplasty and stenting. Can Assoc Radiol J. 2001 Jun. 52(3):174-82. [Medline]. Textor SC, McKusick MA. Renal Artery Stenosis. Curr Treat Options Cardiovasc Med. 2001 Jun. 3(3):187-194. [Medline]. Corriere MA, Edwards MS. Revascularization for atherosclerotic renal artery stenosis: the treatment of choice?. J Cardiovasc Surg (Torino). 2008 Oct. 49(5):591-608. [Medline]. Aqel RA, Zoghbi GJ, Hage FG, Dell'Italia L. Three-dimensional balloon catheter sizing identifies significant underdeployed stents using conventional methods in renal artery interventions. J Invasive Cardiol. 2008 Jun. 20(6):270-6. [Medline]. Clemente A, Macchi V, Porzionato A, Stecco C, De Caro R, Morra A. CTA and 2D-3D post-processing: radiological signs of fibromuscular dysplasia of renal artery. Surg Radiol Anat. 2009 Jan. 31(1):25-9. [Medline]. Dubel GJ, Murphy TP. The role of percutaneous revascularization for renal artery stenosis. Vasc Med. 2008. 13(2):141-56. [Medline]. Pappas P, Zavos G, Kaza S, Leonardou P, Theodoropoulou E, Bokos J, et al. Angioplasty and stenting of arterial stenosis affecting renal transplant function. Transplant Proc. 2008 Jun. 40 (5):1391-6. [Medline]. Jenks S, Yeoh SE, Conway BR. Balloon angioplasty, with and without stenting, versus medical therapy for hypertensive patients with renal artery stenosis. Cochrane Database Syst Rev. 2014. CD002944. [Medline]. Herrmann SM, Saad A, Textor SC. Management of atherosclerotic renovascular disease after Cardiovascular Outcomes in Renal Atherosclerotic Lesions (CORAL). Nephrol Dial Transplant. 2015 Mar. 30 (3):366-75. [Medline]. [Full Text]. Textor SC, McKusick MM. Renal artery stenosis: if and when to intervene. Curr Opin Nephrol Hypertens. 2016 Mar. 25 (2):144-51. [Medline]. Kobo O, Hammoud M, Makhoul N, Omary H, Rosenschein U. Screening, diagnosis, and treatment of renal artery stenosis by percutaneous transluminal renal angioplasty with stenting. Isr Med Assoc J. 2010 Mar. 12(3):140-3. [Medline]. White CJ, Ramee SR, Collins TJ, Jenkins JS, Escobar A, Shaw D. Renal artery stent placement: utility in lesions difficult to treat with balloon angioplasty. J Am Coll Cardiol. 1997 Nov 15. 30(6):1445-50. [Medline]. Jean WJ, al-Bitar I, Zwicke DL, Port SC, Schmidt DH, Bajwa TK. High incidence of renal artery stenosis in patients with coronary artery disease. Cathet Cardiovasc Diagn. 1994 May. 32(1):8-10. [Medline]. Roustan FR, Lareyre F, Bentellis I, Haider R, Torrino S, Sedat J, et al. Endovascular Treatment of Transplant Renal Artery Stenosis: Evaluation of Postoperative Outcomes and Risk Factors for Recurrence. Angiology. 2018 Jan 1. 3319718787665. [Medline]. Chen LX, De Mattos A, Bang H, Vu CT, Gandhi M, Alnimri M, et al. Angioplasty vs stent in the treatment of transplant renal artery stenosis. Clin Transplant. 2018 Apr. 32 (4):e13217. [Medline]. Kidney DD, Deutsch LS. The indications and results of percutaneous transluminal angioplasty and stenting in renal artery stenosis. Semin Vasc Surg. 1996 Sep. 9(3):188-97. [Medline]. Laird JR, Rundback J, Zierler RE, Becker GJ, O'Shaughnessy C, Shuck JW, et al. Safety and efficacy of renal artery stenting following suboptimal renal angioplasty for de novo and restenotic ostial lesions: results from a nonrandomized, prospective multicenter registry. J Vasc Interv Radiol. 2010 May. 21(5):627-37. [Medline]. White CJ, Ramee SR, Collins TJ, Jenkins JS. 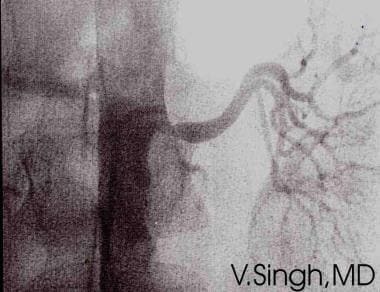 Renal artery stent placement: indications, techniques and clinical results. Indian Heart J. 1998 Oct. 50 Suppl 1:153-60. [Medline]. Williamson WK, Abou-Zamzam AM Jr, Moneta GL, Yeager RA, Edwards JM, Taylor LM Jr, et al. Prophylactic repair of renal artery stenosis is not justified in patients who require infrarenal aortic reconstruction. J Vasc Surg. 1998 Jul. 28 (1):14-20; discussion 20-2. [Medline]. Bajwa TK, Shalev YA, Gupta A, Khalid MA. Peripheral vascular disease, Part 2. Curr Probl Cardiol. 1998 Jun. 23(6):305-48. [Medline]. Henry M, Amor M, Henry I, Ethevenot G, Tzvetanov K, Courvoisier A, et al. Stents in the treatment of renal artery stenosis: long-term follow-up. J Endovasc Surg. 1999 Feb. 6 (1):42-51. [Medline]. Dorros G, Prince C, Mathiak L. Stenting of a renal artery stenosis achieves better relief of the obstructive lesion than balloon angioplasty. Cathet Cardiovasc Diagn. 1993 Jul. 29 (3):191-8. [Medline]. Weibull H, Bergqvist D, Jonsson K, Hulthén L, Mannhem P, Bergentz SE. Long-term results after percutaneous transluminal angioplasty of atherosclerotic renal artery stenosis--the importance of intensive follow-up. Eur J Vasc Surg. 1991 Jun. 5(3):291-301. [Medline]. Dean RH, Kieffer RW, Smith BM, Oates JA, Nadeau JH, Hollifield JW, et al. Renovascular hypertension: anatomic and renal function changes during drug therapy. Arch Surg. 1981 Nov. 116 (11):1408-15. [Medline]. Bax L, Woittiez AJ, Kouwenberg HJ, Mali WP, Buskens E, Beek FJ, et al. Stent placement in patients with atherosclerotic renal artery stenosis and impaired renal function: a randomized trial. Ann Intern Med. 2009 Jun 16. 150 (12):840-8, W150-1. [Medline]. Zachrisson K, Elverfors S, Jensen G, Hellström M, Svensson M, Herlitz H, et al. Long-term outcome of stenting for atherosclerotic renal artery stenosis and the effect of angiographic restenosis. Acta Radiol. 2018 Jan 1. 284185118764209. [Medline]. Bittl JA. Optimizing the benefits of renal artery stenting. Catheter Cardiovasc Interv. 1999 Jun. 47 (2):173-4. [Medline]. Burket MW, Cooper CJ, Kennedy DJ, Brewster PS, Ansel GM, Moore JA, et al. Renal artery angioplasty and stent placement: predictors of a favorable outcome. Am Heart J. 2000 Jan. 139 (1 Pt 1):64-71. [Medline]. Lederman RJ, Mendelsohn FO, Santos R, Phillips HR, Stack RS, Crowley JJ. Primary renal artery stenting: characteristics and outcomes after 363 procedures. Am Heart J. 2001 Aug. 142(2):314-23. [Medline]. Radermacher J, Chavan A, Bleck J, Vitzthum A, Stoess B, Gebel MJ, et al. Use of Doppler ultrasonography to predict the outcome of therapy for renal-artery stenosis. N Engl J Med. 2001 Feb 8. 344 (6):410-7. [Medline]. Cooper CJ, Murphy TP, Cutlip DE, Jamerson K, Henrich W, Reid DM, et al. Stenting and medical therapy for atherosclerotic renal-artery stenosis. N Engl J Med. 2014 Jan 2. 370(1):13-22. [Medline]. Marraccini P, Bianchi M, Fommei E, Palmieri C, Ciriello G, Ciardetti M, et al. Contrast medium nephrotoxicity after renal artery and coronary angioplasty. Acta Radiol. 2010 May. 51(4):462-6. [Medline]. Havey RJ, Krumlovsky F, delGreco F, Martin HG. Screening for renovascular hypertension. Is renal digital-subtraction angiography the preferred noninvasive test?. JAMA. 1985 Jul 19. 254(3):388-93. [Medline]. Jaff MR. Management of Atherosclerotic Renal Artery Stenosis: Interventional Versus Medical Therapy. Curr Interv Cardiol Rep. 2001 May. 3(2):93-99. [Medline]. Pickering TG. Diagnosis and evaluation of renovascular hypertension. Indications for therapy. Circulation. 1991 Feb. 83(2 Suppl):I147-54. [Medline]. Grist TM. Magnetic resonance angiography of renal artery stenosis. Am J Kidney Dis. 1994 Oct. 24(4):700-12. [Medline]. Losinno F, Zuccalà A, Busato F, Zucchelli P. Renal artery angioplasty for renovascular hypertension and preservation of renal function: long-term angiographic and clinical follow-up. AJR Am J Roentgenol. 1994 Apr. 162 (4):853-7. [Medline]. Percutaneous transluminal renal angioplasty in middle-aged woman with malignant renovascular hypertension. This preprocedural right renal arteriogram was obtained after sterile preparation and draping of the patient, conscious sedation, infiltration of local anesthetic (lidocaine 1% or 2% solution) at the femoral access site, placement of an arterial sheath in the femoral artery, and advancement of the renal guide catheter over a 0.035-in. guide wire under fluoroscopic guidance. 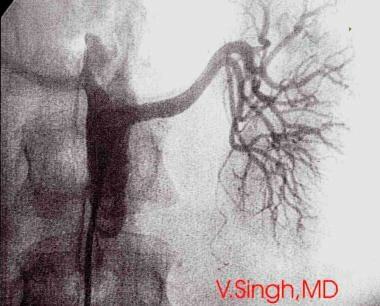 After the tip of the guide catheter is positioned at the ostium of the renal artery, an angiogram (as shown here) is obtained. After the guide wire is removed, the proximal end of the catheter is connected to a manifold, and 4-8 mL of contrast is manually injected during cineangiographic recording. Once obtained, the image may be played over and over in a loop, or a particular frame may be saved for review during angioplasty. An intravenous antithrombotic agent, usually heparin, is administered before the clinician proceeds with angioplasty. The patient's activated clotting time is monitored. A 0.018-in. guide wire is advanced through the 6F renal guide across the ostial right renal stenosis. A small torque device is used over the proximal segment of the guide wire for steering, while a small terminal bend is created by hand over the distal end of the guide wire before it is introduced into the guide catheter. Passage of the guidewire is monitored by using fluoroscopy and injections of small amounts of contrast agent. Occasionally, a combination of torque and forward pressure is required to cross the lesion. In addition, in tight lesions, the balloon catheter is sometimes advanced and used as a support for passage of the guide wire. A 6-mm × 18-mm balloon is positioned across the lesion by carefully advancing it over the guide wire. The balloon is prepared before it is loaded over the guide wire by connecting its proximal balloon port to an inflating device that contains a half-and-half solution of contrast agent and sterile saline and then by drawing negative pressure to extrude any air bubbles. The inflating device is left in negative pressure while the balloon is advanced with one hand and the guide wire is held with the other. The balloon is advanced beyond the distal end of the guide catheter, which is gently pulled back, and the balloon is straddled across the stenosed segment. A small amount of contrast agent is injected to confirm proper positioning of the balloon. The balloon is inflated by increasing the pressure with the inflation device to several atmospheres of pressure (usually 4-8 bars). The mixed solution of contrast agent and saline in the inflation device gradually moves into the balloon. As the balloon expands, it becomes visible under fluoroscopy, as shown. The balloon is held up for several seconds to apply circumferential pressure on the stenosed arterial segment and then deflated and gradually pulled back into the guide catheter. Angiogram obtained after percutaneous transluminal angioplasty and after the balloon catheter is removed but while the guidewire is still retained shows increased luminal diameter at the stenotic segment. However, the segment appears to be at least 50% narrowed. Flow into the renal artery from the aorta is increased. The vascular wall shows no clear dissection. No filling defect (which may represent clot) is visible. Distal flow into the branches of the right renal artery is brisk, with good tissue flush. A stent-balloon catheter is prepared in a manner similar to the balloon catheter; however, before it is inserted into the guide catheter, no negative pressure is created. The stent-balloon catheter is then advanced over the guide wire through the guide catheter beyond distal opening and across the lesion. The stent is positioned over the lesion by confirming its placement with the injection of a small amount of contrast material through the guide. The guide catheter is pulled back on the wire a little to allow the proximal edge of the stent to be slightly in the aorta. Before the stent balloon is inflated, the guide catheter is pushed upward to straighten the stent and wire in the proximal portion of the renal artery. The stent is then deployed by first creating negative pressure in the stent balloon and then by inflating it by injecting the contrast agent–saline solution through the inflation device. The stent is left inflated for several seconds at 5-10 bars of pressure. The balloon is then deflated and withdrawn while the guide wire is retained across the lesion, and the guide catheter is slightly advanced into the stent. Fluoroscopic image shows the guide wire still lying across the stented segment. The stent shadow is visible in the proximal portion of the right renal artery, and it appears well expanded. Last, the guidewire is withdrawn after the absence of a flap, dissection, or filling defect is confirmed. Poststenting angiogram shows 0% residual stenosis in the proximal renal artery. The guide catheter is finally withdrawn. Preangioplasty angiogram obtained in a young woman with malignant hypertension shows tight stenosis in the middle segment of the right renal artery. Its appearance is consistent with that of fibromuscular dysplasia, for which angioplasty is the procedure of choice and for which stenting is usually not indicated. Intra-arterial nitroglycerine, 300 mcg, was given without any change in the appearance of the stenosis (which differentiates it from spasm). 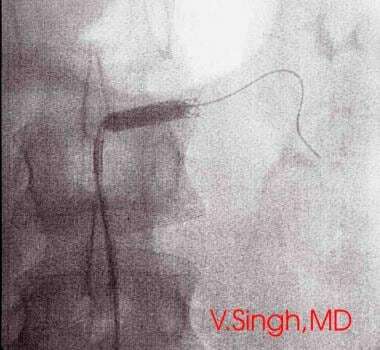 Fluoroscopic image shows an inflated percutaneous transluminal angioplasty (PTA) balloon in the midright renal artery over the guid ewire. In this case, a Judkins right 4 (JR4) guide was used to access the right renal artery via a right femoral approach. The balloon was left inflated for several seconds, then deflated and pulled out. Additional intra-arterial nitroglycerine was infused. Angiogram obtained after percutaneous transluminal angioplasty and after the balloon catheter was removed shows a good result with residual stenosis of less than 20% at the previously stenosed site. Flow into the renal artery from the aorta is increased. The vascular wall shows no clear dissection. No filling defect (which may represent clot) is visible. Distal flow into the branches of the right renal artery is brisk, with good tissue flush. Alan Cousin, MD, is gratefully acknowledged for the contributions made to this article.